We all have our favourite work of art; whether it’s a painting that means something to you personally, a sculpture that inspires happy memories, or a series that you just couldn’t stop thinking about, some art just stays with you. This year to celebrate World Art Day the Trinity House Team talk about their favourite artworks. 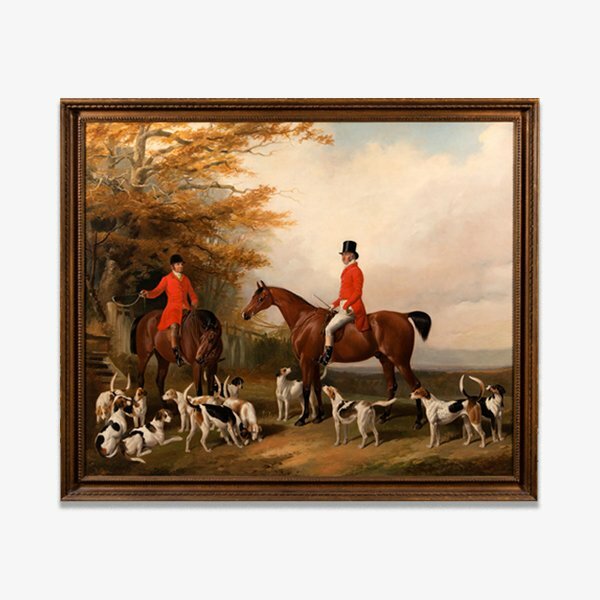 This fabulous painting by William Barraud is not only is a great image of wonderful quality, but for once it’s all about the hounds rather than the Horse and Huntsman for once. Barraud has gone through great trouble to achieve a composition where the hounds have such presence. The original frame is also adorned with the names of each hound, and must have been created for the owner of the hounds which is unusual. Even better for me is this painting has been in an important private collection in New York for over 100 years and has been handed down to the current owners. A rare work that we are lucky have the privilege to handle. This piece was painted in 1964 the year Lanyon died in a hand glider accident, it is a real shame as he was just starting to gain international recognition over in the States and was spending time and finding artistic influence from other artists such as Rothko and Motherwell. He is without doubt one of the most important abstract artists Britain has produced and his work is very hard to find on the open market with one work from 1961 selling for a record 1.5M GBP at the end of last year. There is a general feeling in the market that Lanyon has room to grow as when you compare the US and British artists from this period and the prices they make the Brits are lagging behind considerably. We live in a world that is frenetic, busy and noisy…a great artwork can stop the world spinning and transport you there. From the moment Le Sidaner arrived in Villefranche he was captivated, and this particular painting invites me to sit on the terrace and enjoy the stillness and peace which he portrays. Known for his atmospheric paintings, with dappled brushstrokes, a master of the hazy soft light, I can imagine a warm breeze whilst watching the subtle play of lights from the distance shores on the water. Everything is tranquil, no humans infiltrate the scene and yet we are invited to sit and enjoy the pleasures of a simple life. The work by Christopher Nevinson is one of my favorites. Having been apart of the crew team for my university, It was always a goal to participate in the Henley regatta. Last year in 2018 I had the privilege of attending the regatta as a spectator. The town comes alive with people from all around the world cheering on the rowing elite. This work illustrates the beautiful landscape and activity that takes place on the shores of the Thames River. There’s something romantic about an era of peace and tranquility which this beautiful watercolor captures. I love how Degas’ pastel and charcoal captures an intimate moment between M & Mme Rouart and those of us observing can only guess what was being said at what looks to be a private moment. This couple were close friends of the Degas family and they used to gather together regularly for dinner at Degas’ family home where one can imagine him sketching away in the corner as others chatted and socialized. Those who know the breadth and range of Degas’s work well, would recognize his fluid strokes across the paper but to the untrained eye, this intimate study of a couple known to the artist may not be attributed to the same artist who paints the iconic ballarinas, that he is so well known for. Othon Freisz is not usually an artist that I would pick out as a favourite but there’s something about the this picture that I just love. Friez is best known as a Fauvist but for me I just love the more muted pallet used here. When I was younger we often took holidays in Northern France and the grey skies and busy harbour take me right back there. To me this is all about ying and yang, the idea that all things exist as inseparable and contradictory objects. I love how the brilliant green leaves stretch out of the composition, escaping from their exotic coral climate and drawing the viewer in. If the contrasting colours and tropical background lighten the mood, the solemn figure in the centre does quite the reverse. Despite the beauty of his surroundings he is in a world of his own. He seems oblivious of the beautiful butterfly fluttering above him, and his only connection to the objects around him is the thin white chord he holds on to. Having lived and worked for some years in Roquetas de Mar in the province of Almeria, in Andalucía Spain, this is the Trinity House Paintings work of art I am currently most emotionally connected with. This beautiful still-life is greatly influenced by both those great artists, Picasso and Juan Gris, in the lines of the composition and the subject matter. Guitars had always been a key elements in Spanish still-lifes and art. They represented the country’s heritage, harking back to the flamenco music of the South and Spain’s rule under the Moors.